Summary: Many treadmills covered here will claim ‘commercial quality’ or features found in the gym. When you choose a Nordic Track model, particularly a high-spec one like the Elite 2500, you’ll get genuine commercial gym kit – with no ‘ifs’ or ‘buts’. This is an amazing machine which is suitable for shared use and has every bell and whistle you can imagine. It is a big model, with a shock absorbing running surface that will keep you free from jarring impacts. An impressive console and fans that cool you as you run are the icing on the cake. Check out the impressive gallery for yourself on the dedicated amazon.co.uk product page. You’ll get a robust machine. The running surface is big enough that you could place many budget treadmills on it. Dimensions are 190cm long, by 93cms wide and 160cms tall (at the top of the console). This is a heavy duty 100kgs in total, and users up to 145kgs can use it – that is more than 22 stone in imperial measures. The two grilles are a design feature which will immediately catch your eye. There is one just under the electronic display, and another on a cross bar under the console. These contain fans. While you will not hear much from them, they are powerful enough to keep you cool while you run. The position will ensure that the cool air is just where you need it too! Your running surface is 152cms long by 55cms wide. A two-ply running belt and ‘runners flex’ cushioning is used. This is commercial gym system developed by Nordic Track. It will reduce the impact of your strides on your joints. This is particularly useful during those periods where you are going hard and fast. Incline has a range that puts many other treadmill brands to shame. This takes you from -3% through to a tough +15%. This variable incline makes switching from a gentle jog to a tough run as simple as touching a control. This treadmill goes faster than you’ll ever need. The top speed is a speedy 22 km / hour. You’ll get a full colour display with one-touch controls. The options are presented in terms of your goals (lose weight, compete or simply train). With video included and iPad compatibility, you can set the scene for your run or simply enjoy TV or multi-media. There are a total of 38 pre-set programs, which covers just about every eventuality. If you prefer you can ‘go manual’. Speed and Incline can both be changed at the touch of a button. The Nordic Track Elite 2500 comes with a chest strap to measure your heart and breathing rates. There are also pulse grip sensors. You’ll get a 1-year subscription to the iFit Live community included in the purchase price. Is the Elite 2500 Worth the Extra Money? Unless you are kitting out a commercial / shared gym and need top grade fitness equipment, the big question is one of value. Since you can get some excellent treadmills for half of the price of this amazing machine… is it worth it? For many people, the answer is: If you can afford to, why not go for the very best? 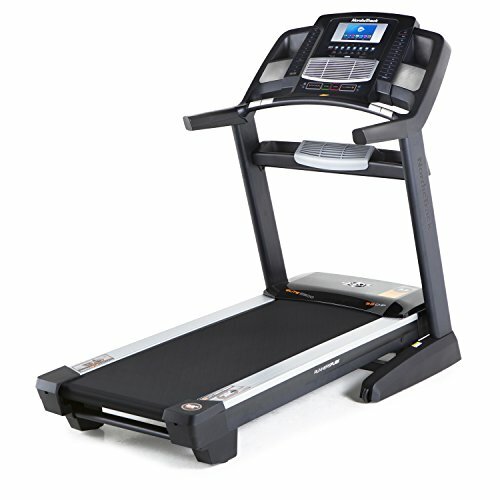 This treadmill has a spec that you will only find in a commercial gym, and is built to last a lifetime. There is a 10-year motor warranty, 2-year parts warranty and lifetime frame warranty included.